GREAT FAMILY BUSINESS OPPORTUNITY ! PUT YOUR ENTREPENEURIAL SKILLS AND SPIRIT INTO THIS LONG ESTABLISHED SUCCESSFUL BUSINESS ! 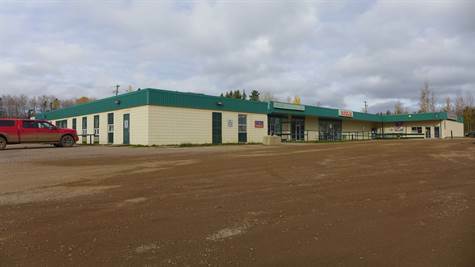 The sale includes: a 17,400 square foot strip Mall; a Tavern with 7 VLTs; a Liquor Store; a Hotel with 24 rooms. The Mall also has 3 tenants: the Post Office; an ATB Financial outlet; a Restaurant. The Grocery is the only one in the Town and operates under the BIGWAY banner and products are purchased from THE GROCERY PEOPLE (TGP). The grocery is about 6600 square feet and has a deli and bakery. The Mall and businesses are well established and have been operating for many years. The Town has a new school with grades 1 to 12; a Recreation Center; a Nursing Station; a Golf Course. For the outdoor enthusiast there are hundreds of acres for sledding and quadding. For the sportsman there is great fishing and hunting. THIS IS A GREAT OPPORTUNITY FOR A FAMILY RUN BUSINESS. The adjacent grocery store is also for sale.